The Home and Home, also called Waupaca vs. Clintonville, is a friendly competition over bragging rights and ownership of the traveling Pinkerton trophy. Ray Pinkerton was a curling promoter during the 1940-50’s. He was responsible for the expansion of the Waupaca Curling Club to a four-sheet club and one of the founders of the Clintonville Curling Club. When the Clintonville curling club was first formed they didn’t have any stones. To solve this problem Ray would load up his station wagon with 32 stones from the Waupaca Curling Club and drive them over to Clintonville for their leagues. He would then return the stones to Waupaca the following week. 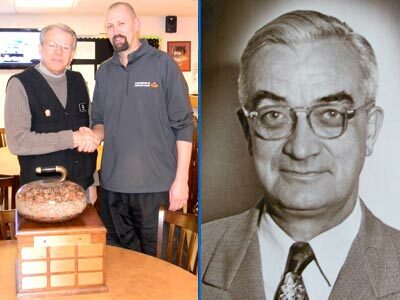 So both the stones and Ray were at home in both Waupaca and Clintonville, hence the name “Home and Home.” Every spring the Waupaca and Clintonville Men compete to honor Ray Pinkerton for his dedication to our Clubs and the sport of curling.